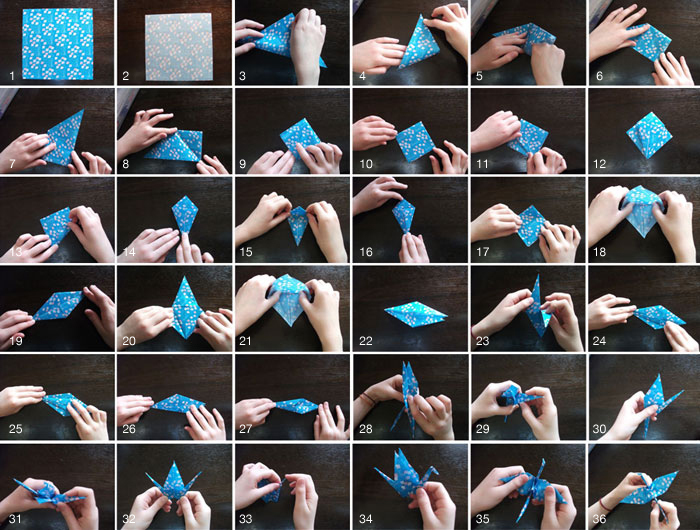 Japanese have a legend that anyone who folds 1,000 paper cranes will have their wish come true.The origami crane has become a symbol of peace from the story of Sadako, a young girl who was exposed to radiation at Hiroshima. 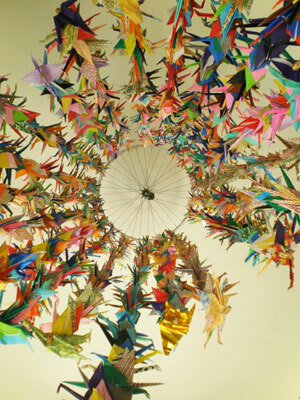 When she was twelve and dying of leukemia, she decided to fold one-thousand cranes according to the legend, in hope that she would live and that there would be peace in the world. She folded 644 cranes before she died in 1955. Her friends and family continued folding them in honor of Sadako. She was buried with 1,000 cranes and a statue was made in her memory. Year after year, people come to pay tribute to her with more origami cranes.Sadako's brother, Masahiro Sasaki, kept five of the cranes his sister folded. In 2007, he decided to disperse these across the continents as a symbol of peace. The North American one is on display at the Tribute WTC Visitor Center in New York in memory of the victims of 9/11. Last year, Mr. Sasaki came to New York in a dedication ceremony which my daughter and a few of her classmates were honored to attend. Now it is time for the world to help the people and families of Japan and give them hope and strength to help rebuild their country. Red Cross. The Red Cross has called up several groups of volunteers and has disaster relief stations in affected regions. You can help immediately by texting REDCROSS to 90999 to give $10. The Salvation Army. You can text the word "JAPAN" or "QUAKE" to 80888 to make a $10 donation to support the Salvation Army's relief efforts. Doctors Without Borders/Médecins Sans Frontières (MSF) is sending teams to the Iwate and Miyagi prefectures in Japan. The teams will focus on the particular needs of more vulnerable populations, including elderly people and young children, as well as people suffering from chronic illnesses such as diabetes and heart disease. 1: Using a square piece of paper, 2: place with the pattern side down. 3: Fold on the diagonal into a large triangle. 4: Fold in half again into a smaller triangle. 5-7: On the corner where two acute-angled corners are laid on top of one another, lift the top one up, "open" it from the inside and flatten into a square. The right-angle corners should all meet. 8-10: Turn it over and do the same to the other acute-angled corner. 11-14: Next fold the four flaps in evenly to meet at the center, so it looks like a kite shape (two flaps on the top, flip over and two on the bottom). 15-17: Fold the top of the "kite" down to make a crease and open it all back to a square. 18-19: Using both hands, with all the four right-angled corners facing you, lift the top-most corner up and "open" and flatten into a skinny diamond shape. 20-22: Turn over and do the same to the other side. 23-27: Where the diamond has a gap in the middle, fold the four flaps in towards the center again, towards the gap, to make a skinnier kite-shape (two flaps on the top, flip over and two on the bottom). 28-32: Fold the one "leg" up and into itself, you need to open it up a little and basically make this and make this "inside-out". This is to make the neck and tail, so it needs to be in between the wings. Do the same for the other "leg". 33-34: Next, in the same way, aout 1/2" from the tip, do a reverse-fold on one side to make the head. 35: Gently pull the wings apart to open it up. 36: You can pull on the tail to make the crane flap its wings. Great post Christine! I read this story with my kids and we all cried. It is wonderful how you put it in the context of the current situation.